So I know I am a little early in my ringing in the New Year, but as most of you know, I flew to South Korea to celebrate Christmas and New Year's Day with my mom. I had a great time, and got to see a lot. Enjoy the pictures I've posted. I'm really trying to remember all of the things I got to see so that I can share them with you. On the first day, Mom and I got our eyebrows waxed....$4.50 was the price....can you believe that. I was so excited as I pay at least $10-15 back home in Texas. 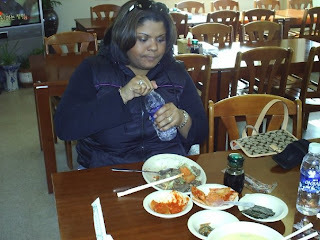 I then had a traditional Korean lunch including kimchi and all. Here are the pictures from that first day. 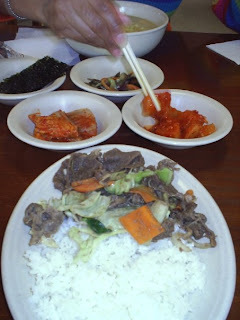 My bulgogi and the rest of the little samplings they give you with your meals....interesting but good! The picture above and below are of me with some of the Dallas Cowboy Cheerleaders. They were in Korea performing for the troops on Christmas. How cool is that? After my first bite of kimchi....SPICY!!! 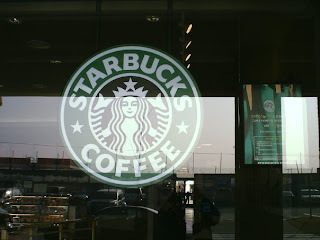 My first stop of the day was to Starbucks--gotta love it!!! 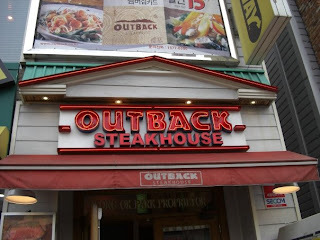 I had lunch and dinner at Outback. I ate the Korean shortback ribs both times. 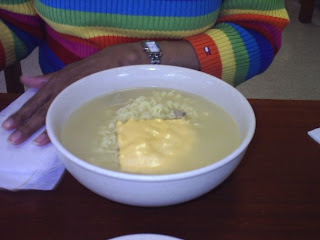 My mom enjoyed ramen noodles with chicken---non spicy! My mom and I at Dunkin' Donuts retreating from the COLD!!! It was BITTERLY cold! I am very excited about 2008. I know I will experience new things, and I can't wait to enjoy them. I'll write more later--I've got to finish packing..I come back to America tomorrow!!!! 5. Do you like eggnog? No!!! 11.. Mail or email Holiday Christmas cards? I don't usually send them, but mail! Update: So here is the only picture I have this far of my new do. 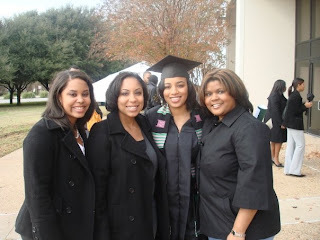 7 of my sorority sisters graduated from Baylor this weekend, and here is Taviea, Malitta, Lisa and I! I'll miss you Lisa, but hope to see you soon! So this is an old picture, but I wanted to test my posting skills!!! I FIGURED IT OUT!!! Stay tuned for pics of my new haircut that I LOVE!!! I'll have to tell you a funny story about it later...until then...enjoy! WOW!!! So I kind of dropped the blog ball!!! Please forgive me. Work has been crazy busy, and I'm getting ready to go to Korea for Christmas. Over the past couple of weeks God's hand has been so evident in my life, or maybe it's that I've just slowed down to listen....either way it's been great. It's so funny how He works, how He places His special touches on EVERYTHING....how it just all works together. Anywho...since my 27th birthday I've really been trying to "choose the right," to seek ye first the kingdom of God, to just find myself, and live the life I am called to live. It's a daily process, and one that I don't want to rush....even the singleness of the moment...there's a blessing and a purpose for me in this as well. Everytime I get anxious...I remember, "be still and know that I am God...." such a sweet sound, telling me that all is well and under control. I'm still investigating how to upload pics....I promise they're coming, just give me some time. MERRY CHRISTMAS, and have a great time with your families! It's amazing how many people blog their lives. 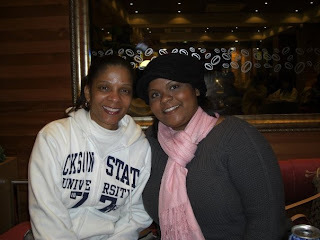 Since I've started my blog, I have found SO many old friends thru blogging. I'm amazed. I am excited about all that this blog will bring. Who knows, you may just start your own blog after reading this one. The holidays are upon us. The weather is changing, sometimes daily, and Christmas is in the air. I Think I Like it!!! So, in an effort to spice up my personal style, I decided to get my hair hi-lighted. You know....spruce up the 'do! I accompanied Malitta to the mall while she picked up a gift for her brother, I decided there was no time like the present to get my hair hi-lighted. Do you know how your hair ranks on the shade scale? Apparently I have really dark hair: 1 shade lighter than the darkest! Well, the stylist and I decided that going 2 shades lighter for highlights would be appropriate. 1 1/2 later....beautiful chocolate brown streaks. BUT, if you know me, then you know my hair, and my hair is pretty much espresso brown....so you could tell the difference, but you couldn't! I wanted a change, pizzazz, the WOW factor!, so we decided I should come back and lighten my streaks up a bit! I'm excited....I could barely wait. 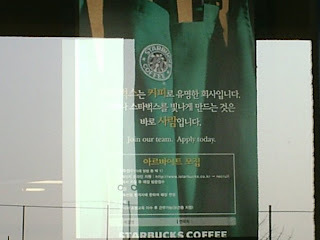 I anxiously climb in the chair to undergo the "caramel experience." I'm laughing just thinking about it. She applies the color to the previously treated strands....no problem, only makes sense to me. Well, I knew that my hair was light when a "TONER" was needed. YEP! She put a toner on my hair before it was all said and done. Now I know that I've kept you in suspense, and my hair looks GREAT, BUT--it is WAAAAAAAAAAY out of my comfort zone. There are pieces of Beyonce' and Mary J. Blige, and knowing me, you know I'm more "natural." I still do a double take when I look in the mirror, I mean WOW! So, if you see me anytime soon, and you really don't know what to say, it's ok! I understand....I'm pretty speechless myself! Pictures to follow shortly! WOW!! I am so excited to have my own blog! I love to write, and I love to keep up with old friends and family, that's a win/win combination!!! If it's been a while since we've last spoken, I'm an 11th grade English teacher now! I LOVE IT! My kids are so funny, and I enjoy teaching them. I still have plans on becoming a National Sales Director with Mary Kay, but in the meantime this is GREAT!